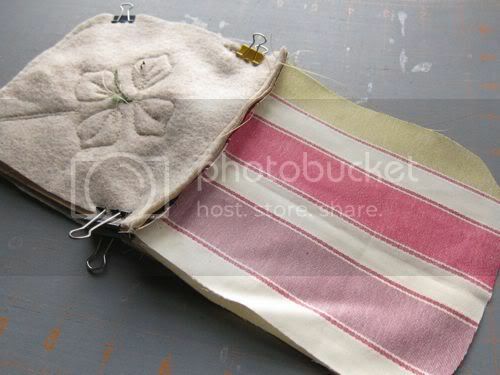 Studio Waterstone | Lori Plyler Art: a zippered pouch tutorial & and ANOTHER giveaway! 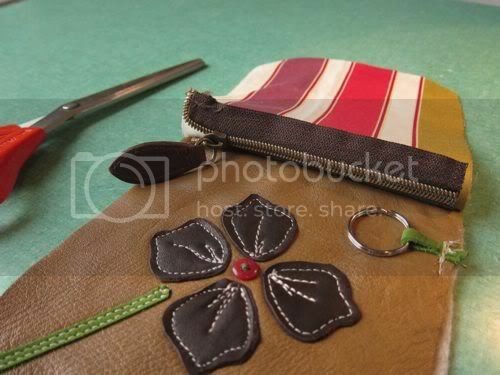 a zippered pouch tutorial & and ANOTHER giveaway! 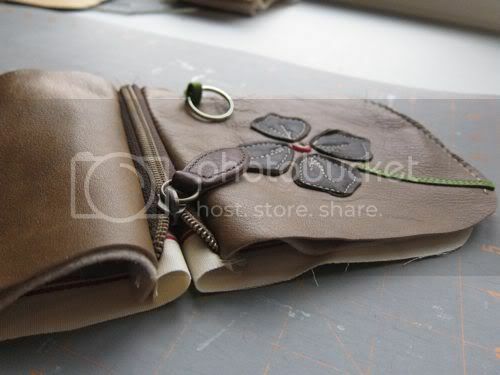 Remember those cute little zippered pouches I made before Christmas? They're perfectly sized for carrying your keys, cash, and girlie stuff. Now it's time for you to see how it's done! Yep. I'm crazy. It's ANOTHER GIVEAWAY! But first, let's show you how you can make one of these babies. Make a pattern on the grocery paper bag using a ruler and marker. This particular pattern is approximately 5 1/4" wide x 6" high with a rounded bottom. 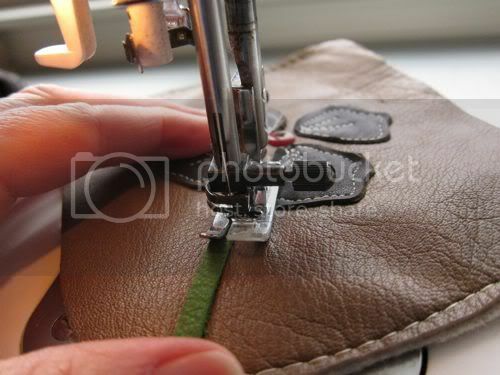 if you're using the interlining cut two of those. 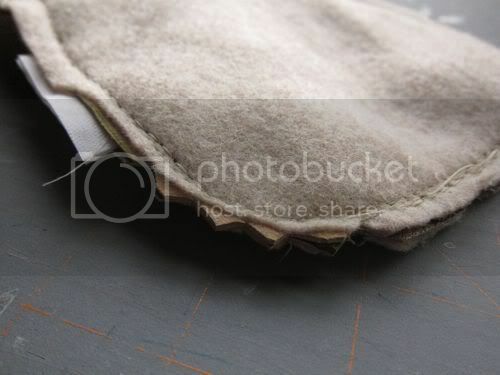 After cutting, I baste the top and bottom of the outer leather and felt. 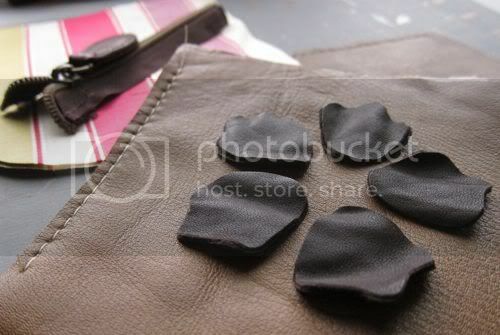 From another scrap of leather, I cut out petals for a flower. As you know, I have a strong desire and affection for imperfection. So this is where you need to have a little fun. Whimsy is your friend. 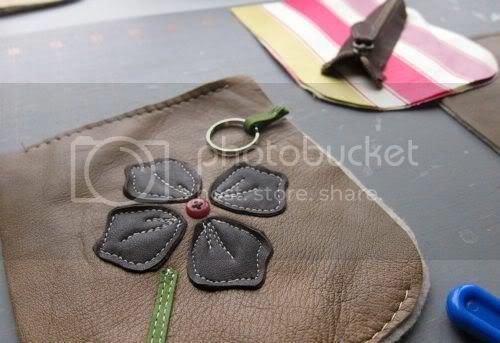 I sew my petals to the leather using a contrasting thread. Now I'm attaching a stem. Don't have green? Brown works great. and sew it to the side facing in as shown. 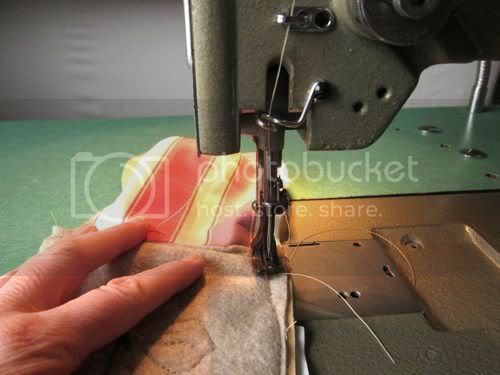 Lay the zipper on top of your leather face down and centered. right sides together. Pin or clip. Stitch the layers together leaving about 1/2" seam allowance. 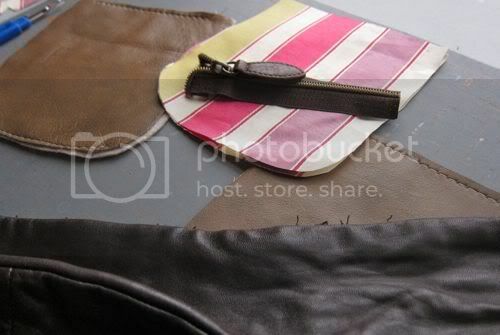 and the zipper outside (with the tab) is facing the outer leather. 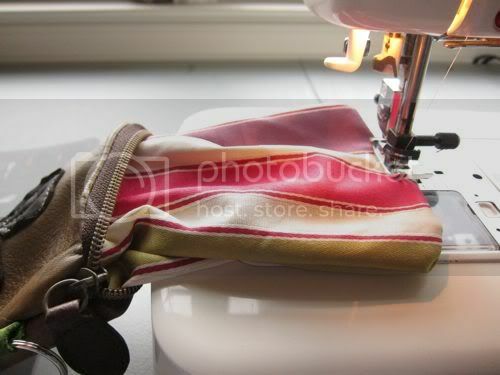 Do the exact same thing with the other side of the zipper. Once it's sewn together, this is what it will look like if you separate the sides. Above you are looking at the inside lining and the INSIDE of the zipper. This is the same view flipped. 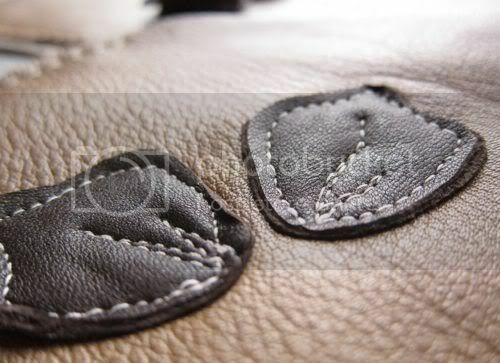 You're looking at the outer leather and the outside of the zipper. Important: Unzip the zipper at this point! 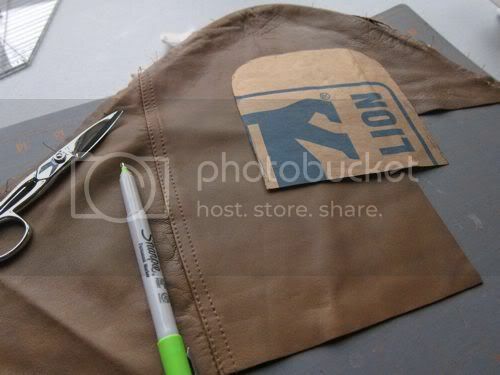 Pin or clip right sides together, leather to leather and lining to lining. The zipper is in the center. 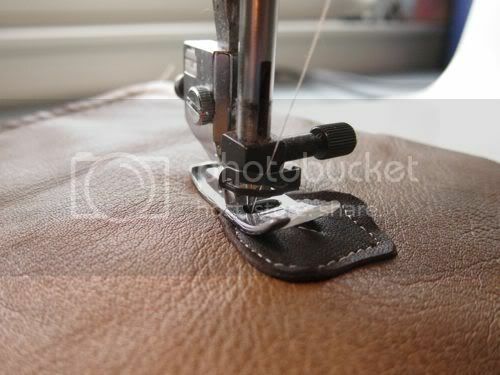 ...making sure to leave an opening at the bottom of your lining. This opening is probably about 3 3/4" wide. 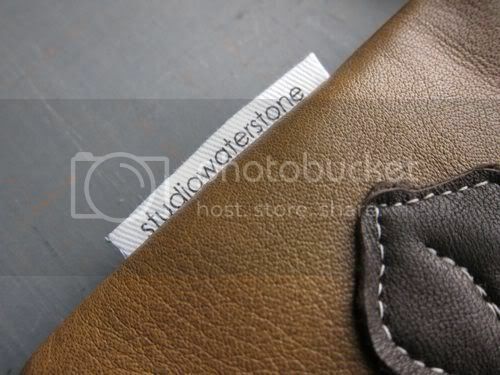 Cut notches around the curved edge of the leather side - not the lining side. Turn the entire thing right side out through the small opening. 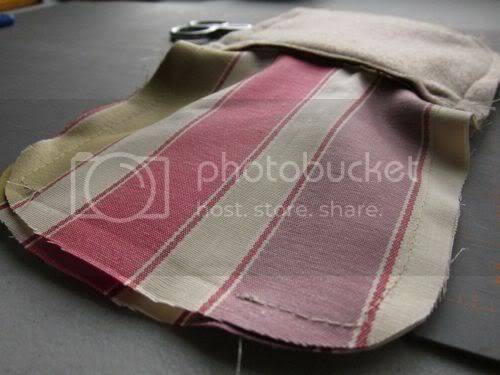 Pin (or don't) the lining opening and stitch closed. 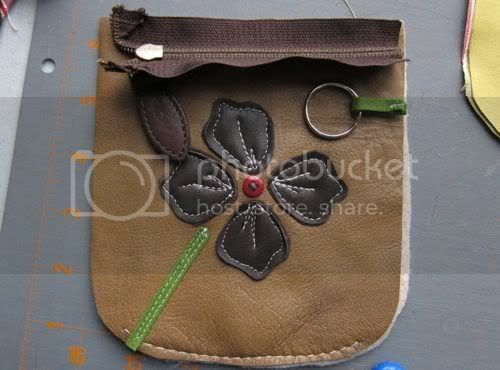 A happy little, eco-friendly recycled leather flower lovin' pouch. you enter to win this baby!!! You have up to SIX chances to win. 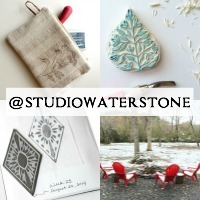 blog about this giveaway - with a link. 4: If you already like me, then talk about the giveaway on Facebook and link to the giveaway. 5: Do you TWEET? Tweet about it - that's one entry. 6: It's time to watch last night's GLEE. Glee demands junk food. Don't ask me why. What's your favorite junk food? Yep, that's one entry, too. Let me know what you've done in the comment section. One more thing. The chance to enter will end this Sunday, the 13th at 11:59 EST. I'll reveal the winner - on Monday. And that rocks. I am going to have to try it with fabric. The tutorial is awesome. So cute! I have the Mama version of this in your script clutch! I like you on FB, I posted a link to this wonderful giveaway. My favorite snack is homemade granola with coconut milk soaked in. and I liked you on fb already. My fav junk food is cool ranch doritos they are like crack to me. http://www.facebook.com/#!/shannon.chomanczuk I shared on fb. 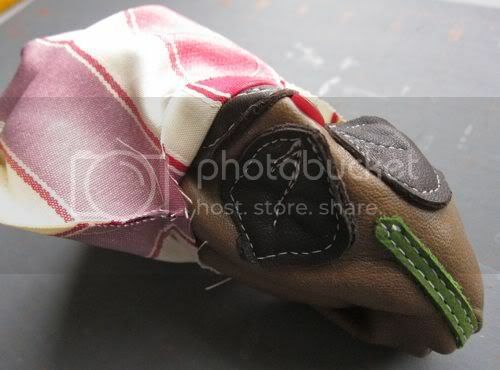 I wish I could sew, I can't so I'll just have to win this! I love your tags, I noticed it right away!!! Favorite junk food is homemade chocolate chip cookies. Favorite junk food... mmm, probably peanut m&m's. It's an old standby that has gotten me by several tough times! I follow you, I like you, and if things are going really bad, I reach for Salt and Vinegar potato chips - even though they leave a weird taste in your mouth for days. But things won't be bad at all if you give me that cute pouch! 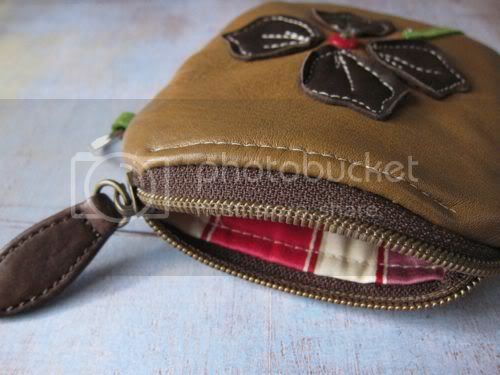 Call me crazy, but I love little purses! And I LOVE LOVE LOVE this one...it is so sweet! Love your signature tags too. -My favorite "junk food"...Peanut M & M's. Favorite Junk Food: Junior Mints! Oh, my...I can't imagine anything that would make me any happier right now than to own one of your creations!!! I'm a follower!!! Favorite junk food is....bar-b-q fritos!!! My daughter saw this and loved it! I do too! So first, my fav junk food - white cheddar popcorn! I am a follower on FB and your blog. Love the tutorial, but need to practice sewing more. 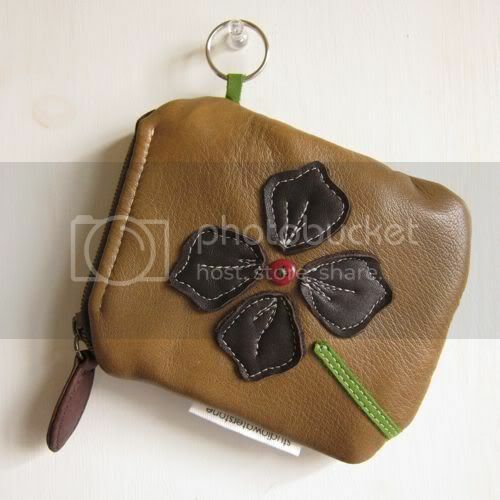 Love these little purses! I already like you on FB and follow this blog. I will be be back shortly when I post on FB and with my favorite snack bc I love Glee! Favorite snack is either Lay's potato chips or Peanut Butter M&Ms. Love them! I am a follower..one favorite junk food, homemade dulce de leche candy. Thanks for the tut! I have been avoiding zippers for YEARS! Seems silly as much as I sew. I think I will try them again....It should go without saying, at this point, how much I love your work!!! You are the giveaway Queen!! My favorite junk food is dark chocolate or Doritos, depending whether I'm in a sweet or salty mood! 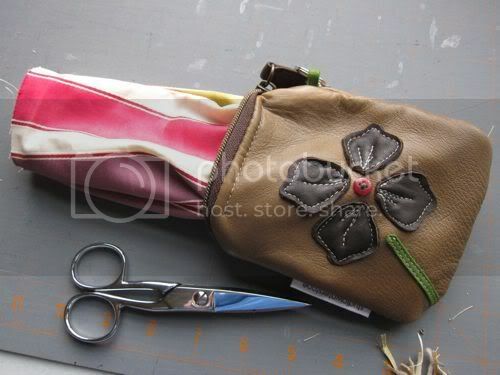 That was a great tutorial - cute little pouch. I am a follower here. Favorite snack - hmm - I have so many:) I guess chips and dip - like the salty. Woo hoo! I'm totally entering this one....I'm not much for tweeting or facebooking but I will try and do a wee blog tomorrow and come back and let you know. And as for JF....I would say pizza but I just don't think that counts as junk food! It's too delicious....so I'll say crisps instead (chips to you guys perhaps?). I try not to have them very often but I do LOVE them! And PS I am a follower! Okay, I have done everything I can to try to get my hands on this beauty...I love it! I am a follower, I posted on my blog with a link, posted on fb with a link. I love ice cream or cake, it's a tie. Thanks for your generosity and the chance again to win! I just happen to be craving my favorite junk food right now! My fav at the moment is malt balls that are covered in peanut butter with a 2nd covering of chocolate! Wishing I had a whole bag full! count me in. 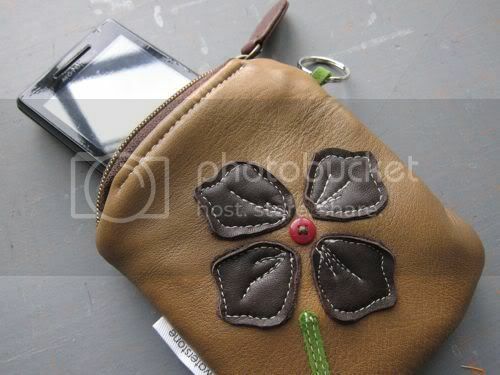 love the pouch! i watched glee. love cupcakes. just became a follower! Count me in too! I'm a follower and like you on facebook. Thanks for the tutorial! Oh so cute,, i'd love to win and I think i'll try my hand at making one too.. so nice of you to share how you did it. I'm a follower and i've posted about it on my blog. Oooh, that's just sweet!! You make it look easy. I follow you here and don't think I could pick a favorite junk food but anything salty is a good choice for me!! You are so talented, I love how you draw with your sewing machine. My favorite junk food is Hersey chocolate kisses. My daughter and I love Glee, the Valentine's show was good. You are so generous with your knowledge, Lori! I love this. But alas, I don't sew. Can I glue gun one? Or maybe duct tape? Nah. Wouldn't have the same pizazz. P.S. My favorite junk food... anything with chocolate! Already a follower, I love your work. My favorite junk food is good ol buttered popcorn! Off to follow you and look around your blog! I thought for sure that I already left a comment but I checked and discovered I didn't so here is the first - 'cause I am a follower! I'm a follower of your wonderful website! Thanks for the tuts and the giveaways! Thanks for the tute - you make it look so simple! 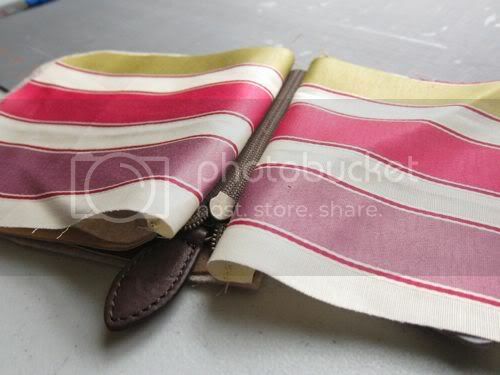 I would love, love, love to win this lovely little pouch! I am a new follower. Thanks for sharing! My second entry is about junk food! I love chips and preferably Sour Cream and Onion. 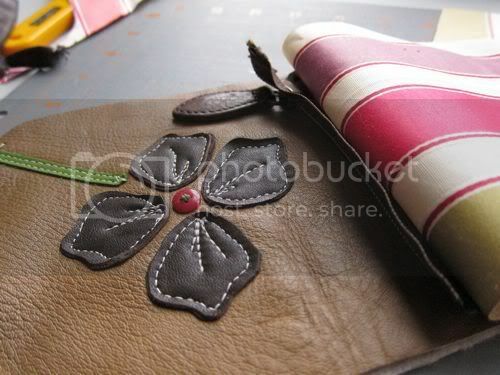 Thanks for the chance to win this awesome pouch - I love it!! I am a follower and on FB, too. I loved this week's glee. My new favorite junk food is Double Stuff Oreo Cakesters. They now have to be banned from the house since I will eat them all in no time flat! Great tutorial! You are so talented. i already follow you. love your blog! your new website looks great! also! my favorite junk food is ice cream! specifically ben & jerry's. phish food. oh yum. I am already a follower on your blog and on FB. 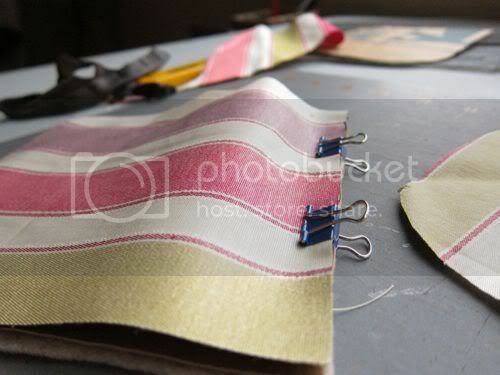 I love the tutorial but I don't sew, not even buttons. 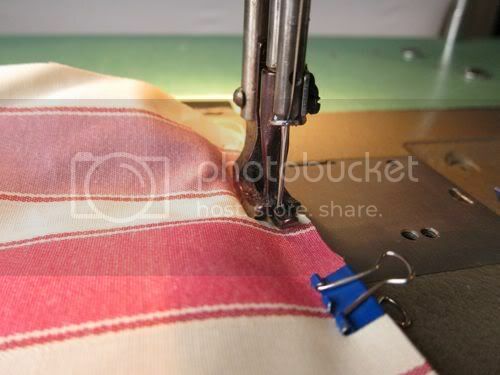 I usually have mom sew my buttons on or hem my pants - sewing machines and I don't mix. Favorite junk food - Pepsi and pizza! I follow you, seriously thinking about recycling my 40 year old pocketbook collection. Thanks for the wonderful tutorials. And am an ice cream addict! Ok, the tut is so easy to follow, that I think I could seriously make one...but I'd much rather win your cutie piece! I am a follower here and on FB. My snack of choice is anything dark Chocolate! I read your blog post about the cute tags, and I think you did a fab job on them!